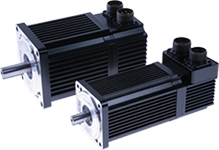 Elwood High Performance Motors designs and manufactures rugged servo motors for harsh and/or specialty environments. Servicing the unique needs of the machine tool, automotive, packaging, food preparation, and varous other industry sectors for the past 45 years has taught us a few things about building motors that survive extreme operating conditions. Whether your needs involve extreme temperatures, high pressure jets of water, sanitation regulation, caustic chemicals or explosive atmospheres, let Elwood High Performance Motors solve your next extreme motor challenge. * Custom Shafts, Keyways, Mounting Flanges, Etc. © 2018 Elwood Corporation. All rights reserved.